Worth waiting for! Rescheduled Spring Art Festival, Saturday, May 16th! Rescheduled because of weather for the 1st time in 33 years, it’s finally here! 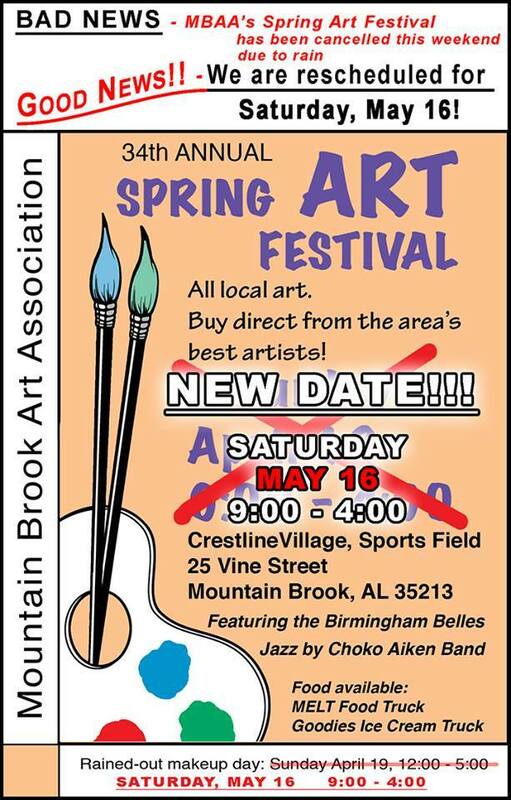 Join us at Crestline Field, Saturday, May 16th, and support your LOCAL ARTISTS! The show will include most of the same artists including a few more artists who can now join us: David Nichols, Melanie Morris, Melanie O’Keefe, Jan Grant, Susan Johnsey, Janice Piper. Don’t miss it! This entry was posted in Announcements, Spring Art Show and tagged crestline art show, crestline field, May 16th, mountain brook art association, rescheduled, Spring Art Show. Bookmark the permalink.